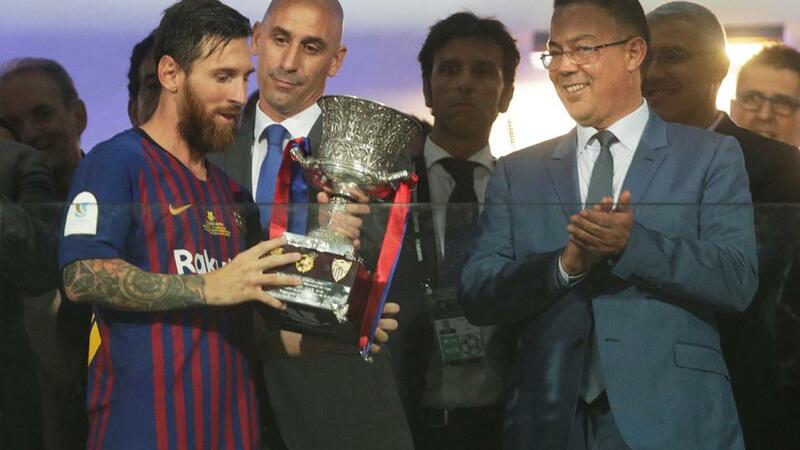 Barcelona beat Sevilla in the Super Cup in August, but how will they fare this time round? "Maradona and Messi are two amazing players - of their own period - that I really appreciate." I think that the recent international break could be good for Barcelona, they were playing a lot of games in a short period and having a rest from that could be helpful. Furthermore Barca, who are one of the favourites in every competition they're in, should not let this rest in fixtures affect their performance. The team should have recovered and training would have restarted, with everybody getting over their international week and focusing on La Liga and Champions League fixtures in the next few days ahead. Barcelona face current La Liga leaders Sevilla at the Nou Camp and are looking for a repeat of their win over them in the Spanish Super Cup in August (where they won 2-1), but it won't be so simple to accomplish that. It's turning into a difficult campaign for both Barcelona and Real Madrid, with teams like Atletico, Valencia and Sevilla fighting for their spot at the top of the table. Sevilla have a chance to grab a result away at Barca. Barcelona are not used to not being on top of the league, and don't want the fans and press getting onto their backs, so you can expect a more determined side to face Los Rojiblancos but I also must remember that this won't be an easy game and they can't ignore the pressure that will be on them. I believe Sevilla have exceeded expectations so far and they have what they need to stay at the top of La Liga. They might even be a long-term contender for the championship as they are playing really well. The team is taking advantage of Barcelona's and Real Madrid's mishaps, and deserve to be where they are at the moment. They are clever and taking their opportunity whilst the other two haven't settled well this season. I think Sevilla will play a little more defensively than usual as a draw would be a decent result for them but I also believe Barcelona have the quality to edge this one and claim an important 1-0 win. Six matches without scoring is common for a player like Luis Suárez, who has runs of scoring often and then not at all. I think this is just a bad phase and sometimes you can't keep the same level of performance every season. There will be times where you play good matches but the ball refuses to cross the line and that ends up frustrating not only yourself, but the fans. The Uruguayan is a great and experienced player that knows how to handle these situations. He will soon back to scoring and more will follow. We cannot deny that Lionel Messi is a world class player and already has his place in the history of the sport, but there is still one thing that haunts his career - not being a World Champion with Argentina. If he already achieved that goal no one could ever criticize him, and I suppose Maradona comments came because of that. When you fail to win with your country, it's normal that some people inside the country to be critical, but that's a part of the game and only shows the quality of a player like Messi beacuase everyone expects great things from you. I'm honestly looking forward to seeing him in one more World Cup to give it a last try, and if he finally gets the icing on the cake, no one can say anything about his achievements. Maradona was a World Champion and that is particularly remarkable for an athlete, to make history for their country but Messi is still looking for that. I know how it feels to be World Champion for your country and is something you can never forget, to bring joy to your people. I'm not criticizing Maradona for his comments. It's normal that sometimes you feel a little frustration when your national team cannot achieve what you want them to, and you end up saying a few bad things to the best players. Maradona and Messi are two amazing players - of their own period - that I really appreciate.